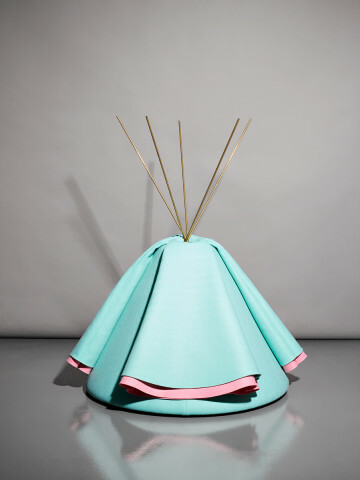 ALLA is a set of sculptures that were born from a hybridisation between an Indian tipi and a garment / costume. There is also an extraterrestrial side, flying saucer or R2D2. A more precise reference for these pieces is a dress made by Matisse for a production of the Ballets Russes "Le Chant du Rossignol" 1920 but also the whirling dervish. The choice of colors evokes a scenography project by Giacomo Balla for Stravinsky's play "Fireworks". The 3 sleeves which fall on the side, are folded up in what produces the image of an object in half-mast. If the sleeves were to unfold, three large inflated cones would appear, similar to voice holders.